If you happen to visit Berlin for a bit longer, you may want to get your dirty laundry clean. Most Berlin Hotels and Hostels do actually offer a laundry service. But if you actually happen to stay longer, chances are you are actually not staying in a Hotel or Hostel – but in an apartment. Some larger short-term rental apartments might have a separate laundry room. Smaller apartments often have at least a washing machine, often located in the bathroom – but that very much depends on the apartment owner / the tenant. Chances are, that privately rented apartments do have some sort of laundry facility built in, whereas professionally rented apartment don’t. Some apartment houses may even have utility rooms or laundry rooms, equipped with a couple of washing machines, that can be used by the tenants of the house. But often you may find yourself without a washing machine at hand. Be it because you just moved into a new apartment, or because your washing machine just broke down, or the apartment you rented for a couple of days or weeks is just not equipped with a washing machine. Some people may also just prefer not to own a washing machine and visit the local laundromat instead. In the end, it can be a nice way to get in touch with the neighborhood while doing the laundry, maybe chat with some neighbors, or just read a book. Good news is: there are still quite a number of self-service laundromats in Berlin. And most of them are in pretty good shape. Many Berlin laundromats today offer Wireless Internet Access, often free of charge for clients. Other laundromats may also offer way more than just access to washing machines and internet: some will serve coffee, food, drinks – or even public events: readings, gigs, concerts or even parties. 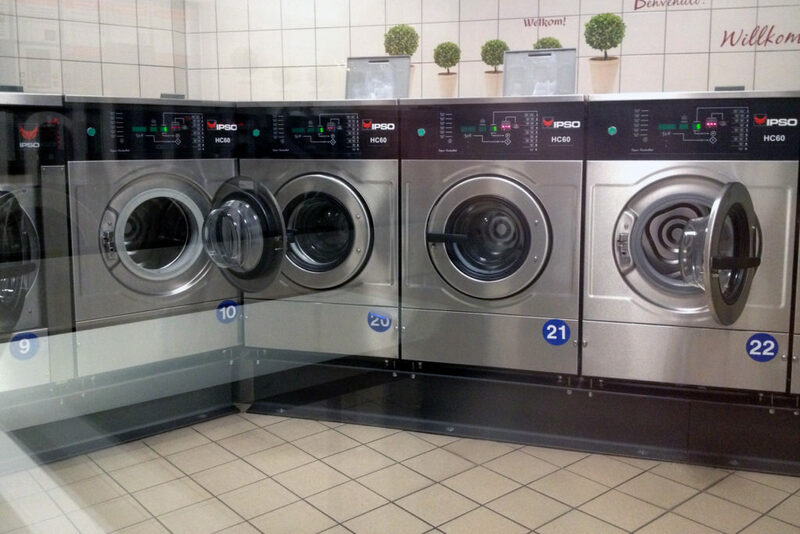 So it may be well worth to check out your local launderette – even if you don’t need to get any dirty laundry done. Here’s a map with self-service laundromats in Berlin. Please feel free to add your suggestions, recommendation and maybe also your experiences in the comments. Happy laundry day! And here you can access the above map at Google.com/maps. self-service laundromat, laundry service, carpets, blankets, etc. But also: kitchen, music, coffee, cake, etc. Missing anything? Please feel free to leave a comment below… Cheers! I live in the Maritim hotel Berlin and am interested to find laundromat or waschsalon nearby Potsdamerplatz, Ka-De-We or other place which can I reach by bus 29 or 200. Or in the distance 5km from hotel.